U.S. 87 runs from Port Lavaca, Texas, northwest to U.S. 2 at Havre, Montana. In Wyoming, U.S. 87 follows Interstate 25 from Colorado north to Glenrock, State Control Route 505 from Glenrock to Casper, Interstate 25 from Casper to Buffalo, Interstate 90 from Buffalo to Fort Phil Kearney, State Control Route 1708 and SH-344 from Fort Phil Kearney to Sheridan, and Interstate 90 from Sheridan to Montana. Between 1926 and 1936, U.S. 87 used to split into U.S. 87E and U.S. 87W in Wyoming and Montana. During this time, U.S. 87 was routed quite a bit differently then. The old routing and split of U.S. 87 was created in 1926, the year of the inception of the U.S. highway system. At that time, U.S. 87 and 287 did not have their current routings. For more, scroll down to the History section. Business U.S. 87 in Cheyenne follows via College Drive, South Greeley Highway, and Central and Warren Avenues. Is combined for a stretch with Business Loop I-25, U.S. 85, and Interstate 180. In Wheatland, Business U.S. 87 follows the Interstate 25 business loop through that city. In Douglas, Business U.S. 87 follows the Interstate 25 and U.S. 20-26 business loops through that city. In Casper, Business U.S. 87 follows the short Bus. Loop Interstate 25 through that city. In Buffalo, Business U.S. 87 follows the Business Loop I-25 through the southern and central part of that city and Business Loop I-90 through the northern part of that city. 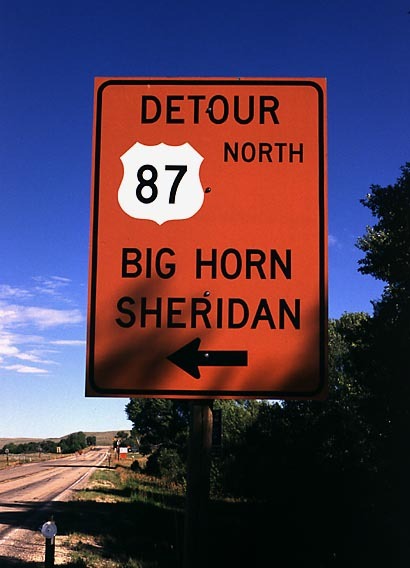 In Sheridan, Business U.S. 87 follows Coffeen and Big Horn Avenues (Business Loop I-90 and Business U.S. 14) through that city. U.S. 87 has several past and present Auxiliary State Routes, including Wyoming 185 and 585. 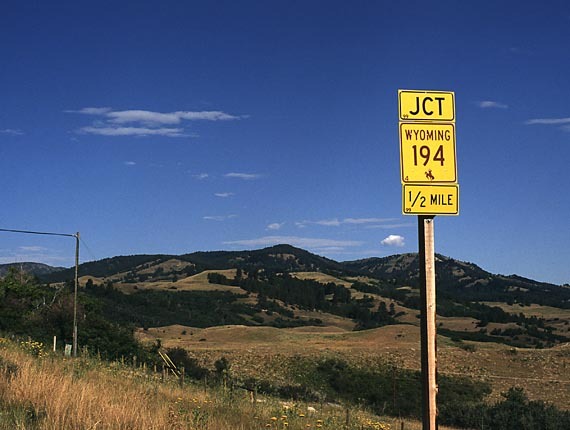 Both of these state routes were at one time considered for introduction into the U.S. highway system: Wyoming 185 as a early- to mid-1930s extension of the old U.S. 185, and Wyo. 585 as a late 1930s addition to the system that would follow numerically after U.S. 385 and 485. Commissioned in 1926, U.S. 87 has a varied and dynamic history. Originally routed through the middle of the state, U.S. 87 was relocated onto its current alignment in the mid-1930s. In its 1926 alignment, U.S. 87 began its northward journey at U.S. 30 in Rawlins, Wyoming, and it followed the current U.S. 287 north to Muddy Gap. At Muddy Gap, U.S. 87 split into U.S. 87E and 87W at the point where U.S. 287 and Wyo. 220 meet today. U.S. 87E followed Wyo. 220 northeast to Casper, then turned north along the current Interstate 25 and U.S. 87 route through Buffalo and Sheridan to Billings and Great Falls. U.S. 87W, meanwhile, followed U.S. 287 northwest to Lander, then turned northeast to Riverton, then headed northwest via current U.S. 26 and U.S. 26-287 over Togwotee Pass to Moran Junction. Then U.S. 87W continued north into Yellowstone National Park. U.S. 87W continued north into Montana via U.S. 89 through Gardiner all the way to Great Falls, where it met U.S. 87E (now 87). The combined U.S. 87 went northwest from Great Falls to Choteau and Glacier National Park. U.S. 87 ended where U.S. 89 ends today. 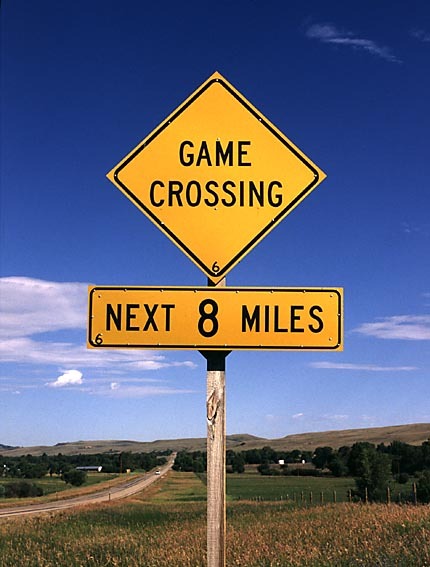 This old definition of U.S. 87 between Rawlins and Glacier National Park fit much better into the "grid" pattern set up originally, as U.S. 87 was at that time, roughly equidistant from both U.S. 85 and 89. Wyoming 87, which may have been a planned extension of the original U.S. 87 south, was commissioned in 1933. It went from U.S. 30 at Creston Junction south to Baggs and Rifle, Colorado. This route was later renamed Wyoming 330 and ultimately Wyoming 789. This route was also considered in the late 1950s for a southern extension of U.S. 187. U.S. 285 between Denver and Laramie was redesignated U.S. 287. U.S. 30 between Laramie and Rawlins was cosigned with U.S. 287. U.S. 87 between Rawlins and Muddy Gap was redesignated U.S. 287. U.S. 87W between Muddy Gap and Yellowstone National Park's South Entrance was redesignated U.S. 287. U.S. 87W between Moran Junction and Great Falls became part of the newly extended U.S. 89. In Colorado, U.S. 285 between Denver and Fort Collins was designated U.S. 87 (and later U.S. 287). U.S. 85 between north of Fort Collins and Cheyenne was cosigned with U.S. 87. U.S. 185 between Cheyenne and Casper was decommissioned and replaced with the new U.S. 87. U.S. 87E between Casper and Billings was recommissioned as U.S. 87. Two changes regarding U.S. 87 were not made in 1936, but came during the intervening years. 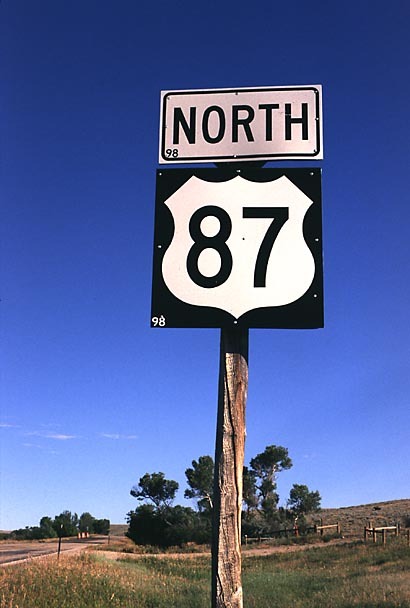 First, U.S. 87E from Muddy Gap northeast to Casper kept its designation until 1939. That year, U.S. 87E became Wyo. 220. Second, Wyo. 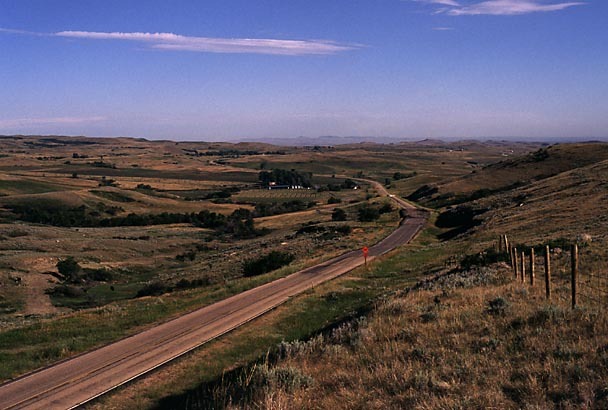 87 south of Creston Junction kept its designation until 1945, when it was redesignated Wyo. 330. In 1954, Wyo. 330 was changed to Wyoming 789. The end result of all this number crunching was U.S. 87 following its current path between Denver and Great Falls in 1936, and U.S. 287 running from Fort Collins to the South Entrance of Yellowstone National Park. Both U.S. 87 and U.S. 287 were extended both north and south between 1936 and 1960. In Montana, the northern extensions of U.S. 287 into Choteau and U.S. 87 into Havre did not occur until the 1940s. 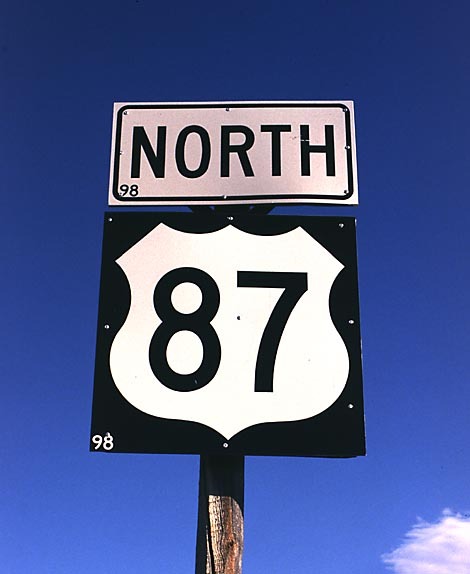 In Wyoming, U.S. 87 became the main north-south route through the eastern and central Wyoming. Between 1936 and 1956, its existence was not threatened; in fact, traffic increased dramatically along it corridor. But with success came improvements, and there was one improvement that would change the U.S. 87 corridor forever. With the passage of the 1956 Interstate Highway Act, the U.S. 87 corridor was planned for an interstate highway (Interstate 25 and Interstate 90). Between 1956 and the 1980s, as more of Interstate 25 was completed, the original U.S. 87 route was recommissioned on the Interstate 25 freeway. By the time Interstate 25 and Interstate 90 were completed, it was clear that U.S. 87 does an awful job of staying away from the interstates in Wyoming. It is only totally independent of all other routes for a short, 16-mile stretch south of Sheridan, although some planning maps show this route as Wyoming 344. Even so, U.S. 87 runs very close to Interstate 90 for this distance. The rest of the time, it is paired with either Interstate 25 or 90. There is some dispute as to whether U.S. 87 pairs with Interstate 25 or U.S. 20-26 east of Casper between Evansville and Glenrock. When I drove it in 1993, that road was marked as U.S. 20-26-87. The mainline interstate was Interstate 25. Rand McNally's Wyoming map (1998) shows the routing correctly. 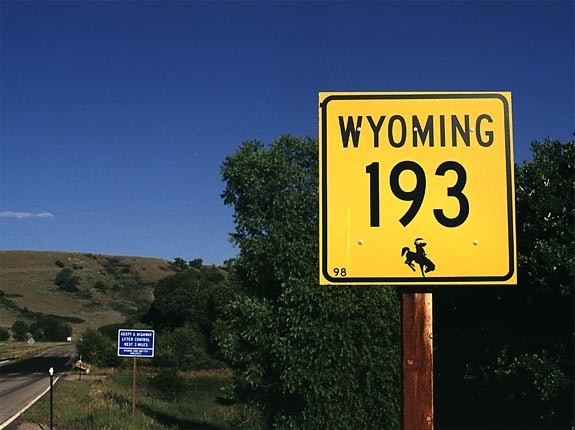 The original alignment of U.S. 87 has been turned into the following secondary state routes (from south to north): Wyoming 223, 219, 321, 320, 319, 254, 259, 196, 338, 344, and 345. For a complete guide of U.S. 87 corridor, go to the Interstate 25, Interstate 90, and U.S. 20 guides for more on the actual route of U.S. 87 in Wyoming. There isn't much of independent U.S. 87 left to write about, except to say that the independent section of U.S. 87 south of Sheridan is there to serve the Wyoming Girls School and the Massacre Hill Historic Site. 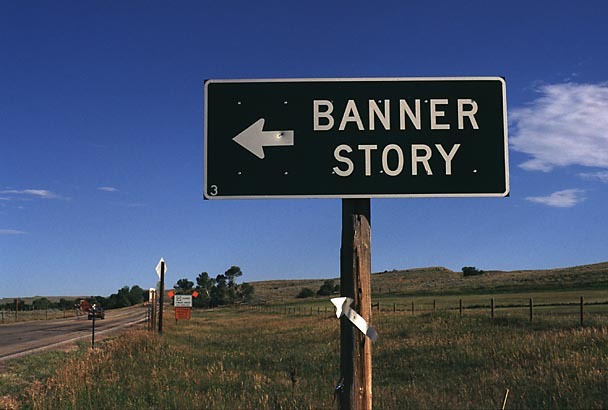 In fact, the short independent section of U.S. 87 (also signed as Wyoming 344) between Interstate 90 north of Buffalo and Sheridan made the news in the late 1990s. 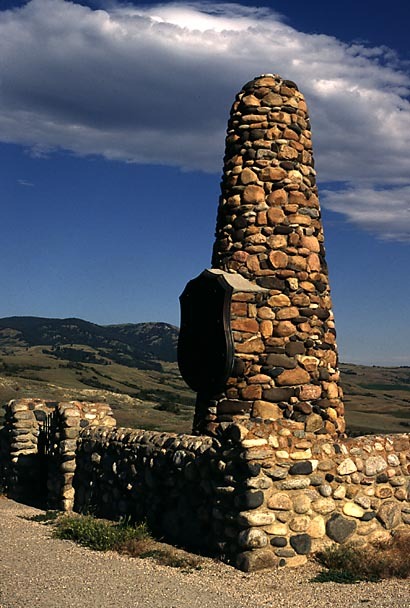 At the Massacre Hill Historic Site, a short segment of U.S. 87 (Wyoming 344) has been permanently closed due to recurring landslides. According to WYODOT, this has been an ongoing, costly maintenance problem, with the most recent series landslides closing the road back in the Spring of 1998. 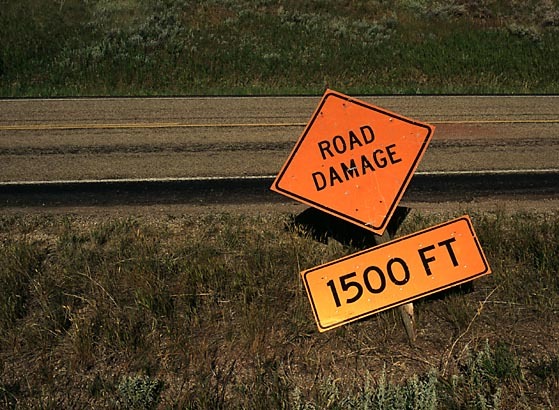 Repairing U.S. 87 (Wyoming 344) in this area could potentially damage the historic battle site, so WYODOT recommends that through traffic use either Interstate 90 or Wyoming 193, which parallels U.S. 87 (Wyoming 344) to the west via Story. 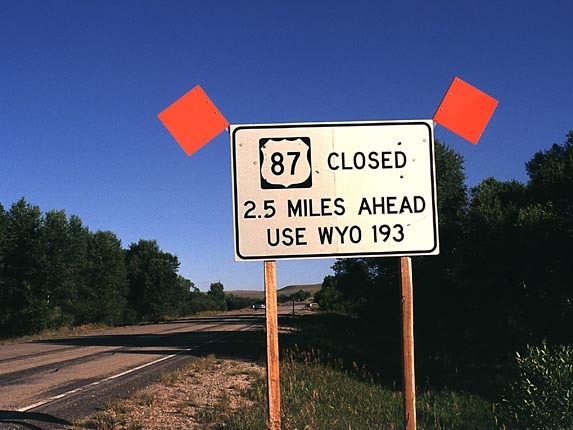 AASHTO denied a request by the Wyoming Department of Transportation to realign U.S. 87 onto Wyoming 193 via Story, so U.S. 87 for now has a literal break in its route. 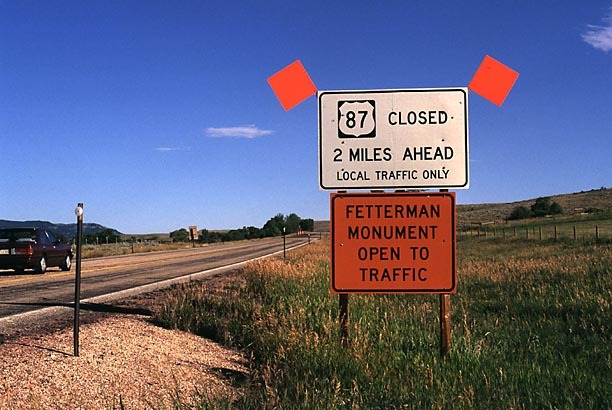 A second extant section of U.S. 87 (separate from the Interstate) exists just east of Casper, where it is signed alongside U.S. 20-26 on Yellowstone Highway. The following map depicts the location of U.S. 87 through the metropolitan area. Northbound U.S. 87 detour/closure signage approaching Wyoming 193. U.S. 87 traffic must use Wyoming 193 Northbound as a detour around the portion of U.S. 87 damaged by the landslide. Photo taken by Jonathan Winkler, 8/00. Photo taken by Jonathan Winkler, 8/00. Northbound U.S. 87 at Wyoming 193. U.S. 87 traffic must use Wyoming 193 Northbound as a detour around the portion of U.S. 87 damaged by the landslide. Photo taken by Jonathan Winkler, 8/00. Fallen warning sign along closed U.S. 87 Northbound near Wyoming 193. Photo taken by Jonathan Winkler, 8/00. 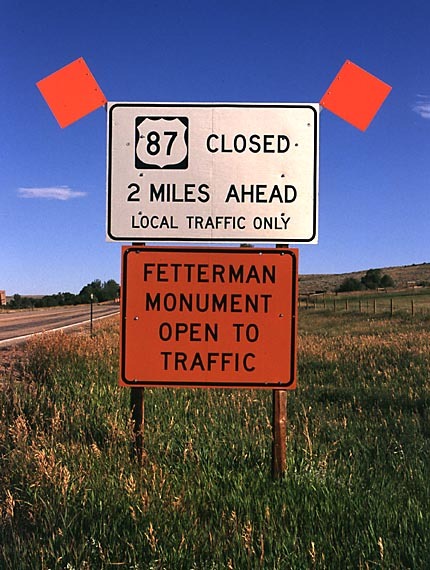 Fetterman Monument is located near the portion of U.S. 87 closed by the landslide. Photo taken by Jonathan Winkler, 8/00. View of closed U.S. 87 as seen from Fetterman Monument. Photo taken by Jonathan Winkler, 8/00. Northbound U.S. 87 shield near Story. Photos taken by Jonathan Winkler, 8/00. Northbound Wyoming 193 (Detour U.S. 87) approaches Wyoming 194 near Story. Photos taken by Jonathan Winkler, 8/00. 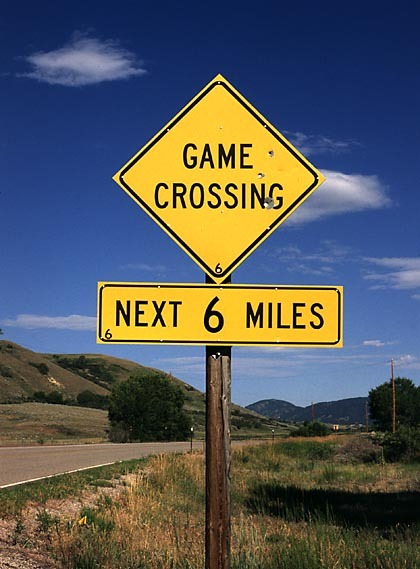 Northbound Wyoming 193 (Detour U.S. 87) game crossing signage near Banner. Photos taken by Jonathan Winkler, 8/00. 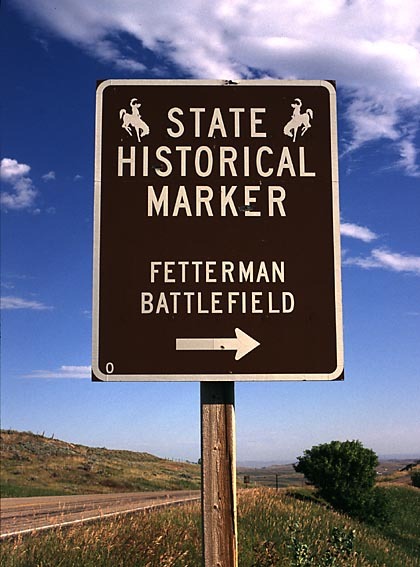 Wyoming 193 route marker along the U.S. 87 detour around Fetterman Monument. Photos taken by Jonathan Winkler, 8/00. Jimmy Callahan from Chicago takes a rest on a U.S. 87W road sign, summer, 1930. This photo copyright 2002 by Mike Callahan/Both Sides Now Publications; used by permission. Note that the sign pole is only about 4.5 feet high, but Jimmy Callahan was 6'0". Compare the condition of the roads in 1930 to how most modern U.S. highways are today. 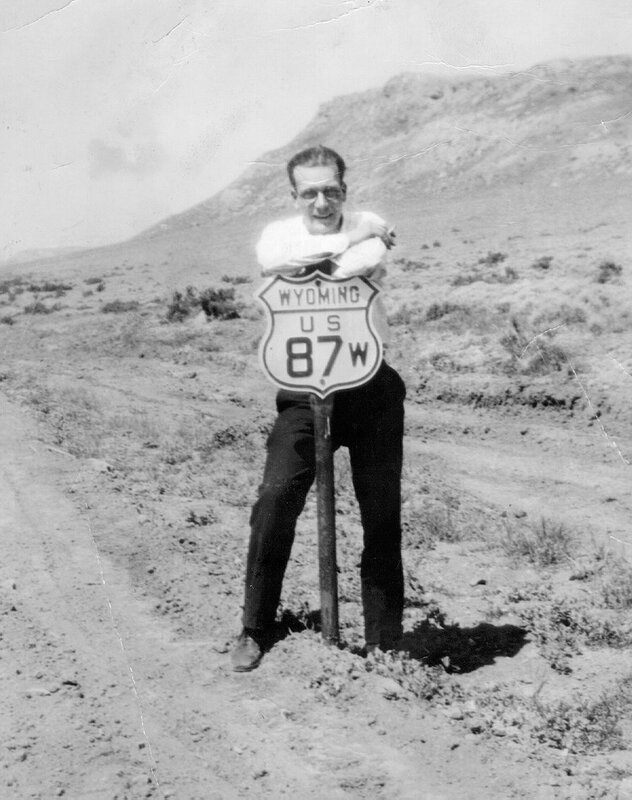 U.S. 87W was decommissioned in 1936 and replaced by U.S. 287 for the most part in Wyoming. Photo taken Summer 1930.